Identical twins Helen and Ellie decide to swop identities at the age of six, for fun. But Ellie refuses to switch back and what starts off as a game turns into a nightmare for Helen. This debut novel deals with social constructs and identity. Positioning Helen as the unfortunate victim, author Ann Morgan raises tough questions in relation to the age-old nature versus nurture debate: How are people's individual personalities developed over the years? Are their characters in-built? Though Morgan is clever to use identical twins as her protagonists, her intentions for the plot wear thin as the novel progresses, resulting in a watered-down psychological thriller that could have been so much more. It is Helen, the smart and spunky leader of the two, who decides that they should switch places as a harmless prank. Swopping clothes and adopting each other's mannerisms, Helen turns into the bumbling and slower Ellie. What Helen does not expect is how easily Ellie takes on the "role" of her sister and no one seems to notice the change. The swop carries forward into their adult lives, eating away at Helen as she loses herself and is sucked into a black hole of self- destruction and despair. Ellie, on the other hand, thrives in her identity. She becomes the favourite child who goes on to be a TV star and leads a picture-perfect life. The entire narrative is told from the perspective of Helen, who adopts various personae throughout the years though it is her self-identification as "Smudge" where Morgan shines in her writing. The author's vivid metaphors give depth to the inner turmoil Helen faces in the process: "There is only the shredding inside you, grinding up the future, emptying you out, pouring all the possibilities away onto the Barnacle's fake marble floor until all your lines are blurred, until you are voided: a shell, a carcass, a mess. Until you are nothing but a smudge." As Helen progressively shrinks into an empty human shell, Morgan puts across unsettling statements on the notion of identity: "Personality, you discover, is a lie.... You don't conform to a set pattern. There's no recipe for who you are." Where Morgan fumbles is the splitting of the narrative. The chapters alternate between a modern-day Smudge as she struggles to make sense of her life as a dysfunctional adult, and the past, when the sisters were children. What begins as a fast-paced and thrilling read slowly dissipates, hampered by the back-and-forth between past and present. Despite establishing Helen as the narrator, Morgan could have further developed Ellie to give more depth to the plot. At times, Helen's wretched life becomes too wearisome, slowing down the flow of the story. 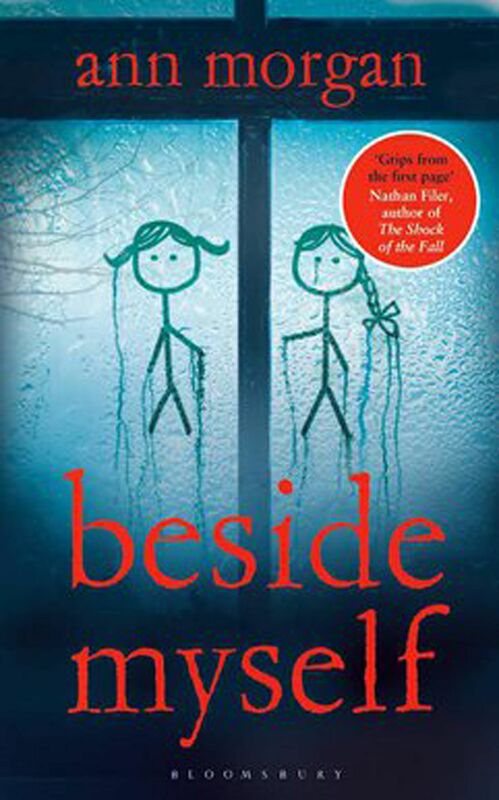 Though the novel begins on a promising note, Beside Myself is crippled by the writer's over- eagerness to develop discussions on bigger issues, leaving an imbalanced and messy storyline. If you like this, read: The Ice Twins by S.K. Tremayne (HarperCollins, 2015, $17.12, Books Kinokuniya), a psychological thriller on the death of an identical twin and a potential case of mistaken identity.